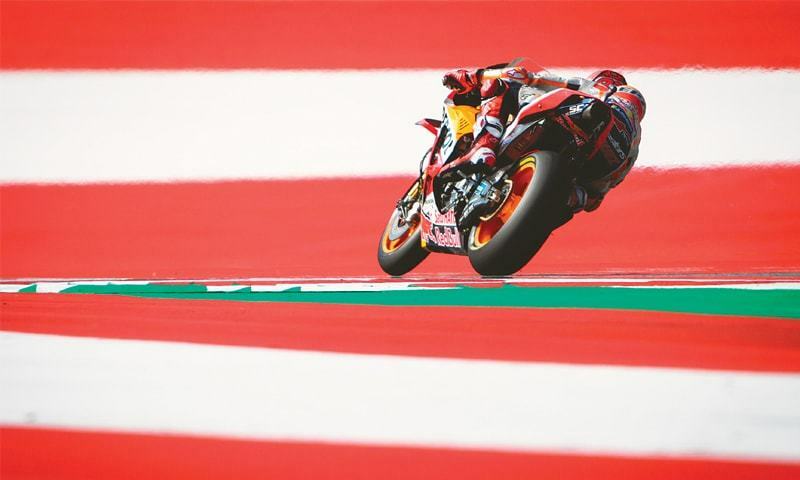 SPIELBERG: Jorge Lorenzo struck the final blow in a dog fight with fellow Spaniard Marc Marquez, overtaking at the start of the final lap on Sunday to win the Austrian MotoGP. Ducati’s Lorenzo and Marquez, on a Honda, traded first place over the closing laps before Lorenzo powered past on the home straight and then held off Marquez on the next corner to pull away to win. Lorenzo, who will be moving to Honda next season, said he made an effort to conserve his tyres in the early part of the race. Marquez could afford to savour the battle because his closest rival in the standings, Italian veteran Valentino Rossi, started from 14th on the grid and could only climb to sixth. The Red Bull Ring remains the only circuit in the championship where Marquez has not won, with Ducati taking all three races since MotoGP returned to the track in 2016. Marquez now leads the standings by 59 points as he closes in on a fifth top-class world title. Lorenzo jumped to third overall, one point ahead of Andrea Dovizioso who finished third on the other Ducati. The Italian, who won last week in Brno, could not quite keep up with the pace of the two leaders. In Moto2, Italian Francesco Bagnaia overtook Portuguese Miguel Oliveira on the final corner to regain first place in the standings. In Moto3, Italian teenager Marco Bezzecchi won to extend his lead over injury-stricken Jorge Martin at the top of the riders’ standings. Silverstone hosts the next round of the championship with the British Grand Prix scheduled to take place on Aug 26.